West's signature retro flair is all over this first poster for his next film, The Sacrement, a shocker about three journalists who visit a relative at a religious commune, where the mysterious Father is the unchallenged leader. The homage to 70s cult films is produced by non other than Eli Roth (Hostel, Cabin Fever). Said West of working with Roth: "He wasnâ€™t trying to make an Eli Roth movie through me. He let me do my thing and he was very protective of, 'This is Ti's movie and let it be like that.' It's a very confrontational movie and it's very horrific and it's very dark. It's different from what people might expect from me and something different from what people expect from Eli as well." 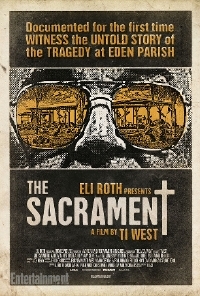 In The Sacrament debuts at next week's Venice Film Festival while its North American premiere is at the Toronto Film Festival.